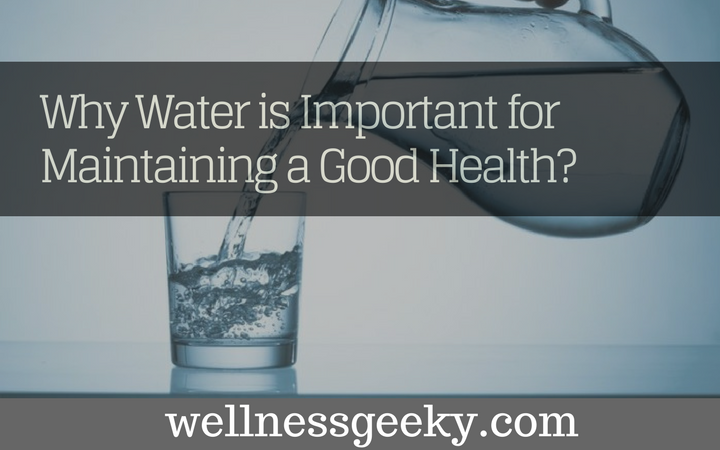 Why Water is Important for Maintaining a Good Health? You are here: Home / Healthy Diet / Why Water is Important for Maintaining a Good Health? The importance of drinking adequate quantities of water and the significant impact it has on the ultimate functioning of the body, and role it plays in maintaining good health is tremendous! It is absolutely essential for the vital functioning of the body and its various organs. Each system in the body is dependent on water, especially the circulatory system. Water is in all body tissue and every cell; both inside and outside of the cells. In fact, two thirds of our body is made up of water! One of the many, and most important of all its functions are to aid the body in absorption of essential nutrients- proteins, vitamins, minerals etc- and to move these nutrients and oxygen from the blood to the cells, collecting waste materials from the body’s cells back to the blood where they are removed from the body; detoxifying the body of harmful waste. Other crucial roles that water plays within the body are: Regulation of body temperature, lubrication of joints and hydration of muscles and tissues to maintain performance, protection of some organs and give shape and form to cells. Water also plays a vital part in the digestion process, it dissolves nutritive material in the process of digestion so that the nutrients can be absorbed by the blood and carried to the cells and tissues of the body where they are needed to build and repair. The skin is an important organ of elimination for the body. It eliminates not only normal bodily waste but poisons and toxins such as lactic acid, (reason why drinking water during and after any form of exercise is crucial as our muscles excrete large amounts of lactic acid when worked.) urea, potassium and sodium chloride are all eliminated through perspiration which is 100 per cent water. All toxins caused by the daily wear and tear of living- including the small amounts of living tissue that are destroyed within the body- can have a poisonous effect on the systems of the body and need to be removed. Pure water dissolves and dilutes these poisons on contact, later expelling them through organs of elimination: lungs, skin, liver and kidneys. Adequate hydration also places a vital part in maintaining healthy organ function especially in the kidney/ lung relationship in the role of respiration. The body’s daily requirements of water depend on the diet, lifestyle and activity of the individual. For example a diet consisting of unhealthy foods such as large amounts of meat, processed and refined foods, fried foods, dairy, sodas and sweet beverages, salt and spices, needs more water to cleanse the system, than a diet consuming large amounts of fruit and vegetables, as these consist of large amounts of water which leads the body needing less to function. The body’s process of osmosis needs water, bones consist of one third of water and muscle and brain cells are made up of seventy one per cent of water! One point five litres of water are lost a day through the skin, bowel and the lungs and via the kidneys as urine; this ensures toxin elimination from the body, and our bodies also produce a third of water when glucose is burnt for energy. A good guide however is a minimum of one litre preferably two litres a day. Water is the only beverage that can really quench the thirst, other beverages only provide temporary relief, relative to the amount of water they have in them. Many of these beverages such as sodas, coffee and teas can be unhealthy alternatives due to the substances such as caffeine that they contain. A point to note is that beverages such as alcohol, tea and coffee have a diuretic effect -drug that increases the flow of urine- that cause the body to lose water and also deplete the body of vital vitamins, and to neutralize one glass of cola with a PH of 2.5, it would take 32 glasses of alkaline water with a PH of 10, reasons why they are not a viable source of liquid intake. Fruit and vegetables consist of about ninety per cent water, a great way for the body to get water as they supply it in a form that is easy for the body to absorb, at the same time supplying vital minerals and vitamins. Drinking a lot of water increases elimination by the intestinal tract mucous membrane lining. This results in the contents of the intestinal tract becoming more fluid, which intern helps with the problem of constipation (dehydration is a major cause of constipation). It also cleanses the blood from its toxic waste which leaves the blood cleaner to build healthy tissue, playing a pivotal role in elimination and repair. One (1) glass of water will shut down midnight hunger pangs for almost 100% of the dieters studied in a University of Washington study. Lack of water is the #1 trigger of daytime fatigue and headaches. A mere 2% drop in body water can trigger “fuzzy” short-term memory, analytical skills like solving basic math problems, and difficulty focusing, for example on computer screens or printed material. Even MILD dehydration will slow down one’s metabolism as 3%. (QUICK way to gain those much needed pounds). To conclude, water is important because it purifies the blood and tissues which enables the body to be cleansed from poisons and waste material. Water dissolves toxic material and foreign substances within the blood aiding their elimination through faeces, urine, sweat and the lungs. It is also a vital part of the body’s cells, tissues and bodily fluids. Because water plays such a vital part and critical role in the proper functioning of the body, it becomes a major component in any therapeutic diet or treatment. So, the next time you reach for that beverage to quench your thirst, to coin a slogan from a popular beverage; obey your thirst by giving it the only drink that truly quenches, reach for the refreshing & rejuvenating, life sustaining power of Water!